We are a leading Manufacturer of safeline - m dsl insulated busbar, safeline - w dsl insulated busbar and safe-duct from Ahmedabad, India. Safeline – M Conductor bars are used for power transmission. 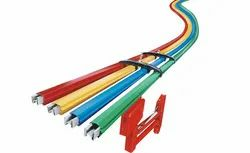 Conductor rails provides safe and economical supply of electric power for track guided Mobile Machinery. Single Pole individually insulated conductors are ideally used for EOT Cranes. 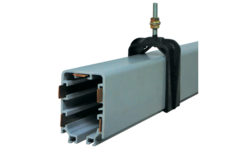 Safeline -W Insulated Conductor Bars are touch proof and have no exposed live parts to come in contact. Quick and easy installation with single bolt and 4 pole hangers. 60 to 400 Amps Conductor are in same standard. 60,100 & 125 Amps : Galvanised Steel. 160,250 & 400 Amps: Rolled Copper. 4.5 meters bar length standard. Cover designed to shed water and dust. Joint cover provides total protection of joints. Enclosed wiring for connection on collectors for safe and simple installation. No expansion joints up to 150 meters For long system, Slide in slot features for hanger supports to eliminate any kind of mis-alignment Track configuration can be Straight or Curved. Safety : due to its isolation it is a protected line. The differences due to expansion are absorbed in every joint of the line. It is not required to place special expansion joints. To extend an existing line is very easy just by adding new tracks. The electric feed can be done at the beginning of the line or at every joint of the line. It is very easy to change a track already assembled without moving the rest of them. 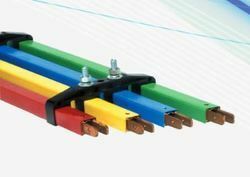 Looking for “DSL Insulated Busbars”?